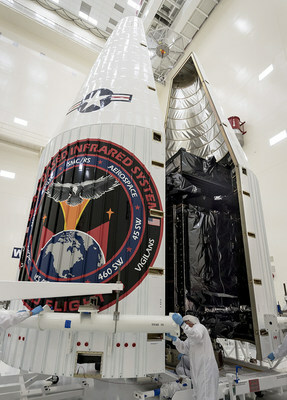 January 10, 2017 – The U.S. Air Force’s next Space Based Infrared System (SBIRS) Geosynchronous Earth Orbit (GEO) satellite, built by Lockheed Martin, was encapsulated on January 7 at Cape Canaveral, Florida, where it will launch on January 19 aboard a United Launch Alliance Atlas V rocket. Encapsulation refers to the sealing of the satellite in a protective launch vehicle fairing -— one of the last steps a satellite must undergo before launch. The SBIRS GEO Flight 3 satellite is the latest to join an orbiting network of satellites equipped with powerful scanning and staring sensors that collect and transmit infrared surveillance information to relay ground stations. This information is used by the U.S. military to detect missile launches, support ballistic missile defense, expand technical intelligence gathering and bolster situational awareness on the battlefield. While SBIRS’ primary mission is strategic missile warning, infrared data will also be made available for new qualified military and civilian uses at the Air Force’s recently opened Tools, Applications and Processing Lab in Boulder, Colorado. The satellite’s journey to launch began at Lockheed Martin’s Sunnyvale, California, facility, where it was built, integrated and thoroughly tested. For its trip to Florida, the satellite was loaded aboard a C-5 Galaxy aircraft at nearby Moffett Federal Air Field. The next SBIRS satellite, GEO Flight 4, is in storage and will undergo final assembly, integration and test prior to its planned 2017 launch. SBIRS GEO-5 and GEO-6, which are currently in production, incorporate Lockheed Martin’s new modernized A2100 spacecraft to dramatically reduce costs and cycle times while increasing the potential to incorporate future advanced sensor suites. The SBIRS development team is led by the Remote Sensing Systems Directorate at the U.S. Air Force Space and Missile Systems Center, Los Angeles Air Force Base, California. Lockheed Martin Space Systems, Sunnyvale, California, is the SBIRS prime contractor, with Northrop Grumman Aerospace Systems, Azusa, California, as the payload integrator. The 460th Space Wing, Buckley Air Force Base, Colorado, operates the SBIRS system.